One order contains four one pound packs of Hickory Smoked Country Bacon from our smokehouse and plant in Madisonville, TN. This bacon is dry cured by hand with salt, brown sugar, and black pepper. After about three weeks curing and drying in refrigeration, it is thoroughly smoked in our wood stove smokehouse for two to three days continuously. Finally, it is packed by hand, mere feet from the smokehouse, and boxed to ship. As it is dry-cured, smoked, and vacuum sealed, it is a very flavorful and shelf stable product that ships unrefrigerated to all US destinations, all year round. We hope you enjoy it! I tell you I just got my second box of bacon and ham..the box even smells like heaven!! Whoever says Benton bacon is not worth the cost just does not know GOOD!! Dinner tonight was simple salad with artichoke hearts, feta cheese and crumbled Benton's bacon. That simple salad was worth the shipping cost!! I will never eat 'store bought' bacon again. First ti,e I had Benton's was 5 years ago in a Low Country Restaurant, downtown Memphis, TN., sprinkled in shrimp and grits! Benton Bacon a sprinkle is just so much soul, man the Benton Family did good taking on this adventure! Would love to visit and give everyone a hug and inhale!!! 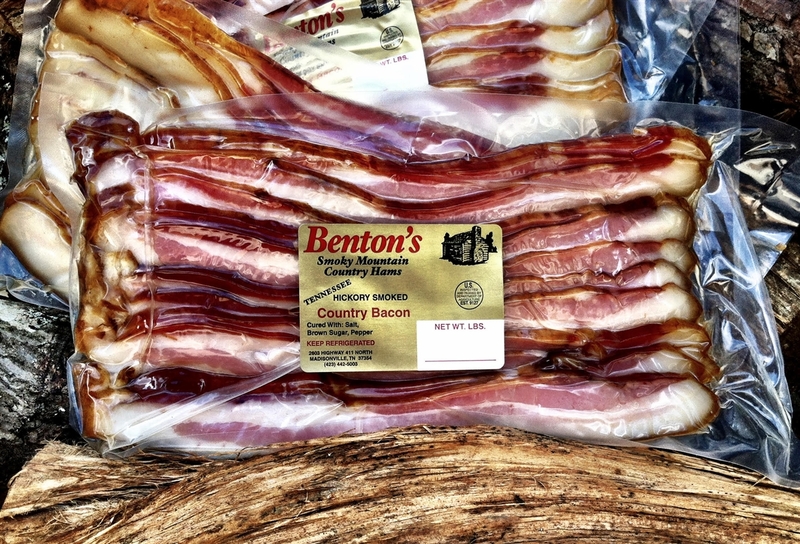 Saw the YouTube video on how Benton's bacon is made, Wow, that got my attention. Pricey with shipping: yes. Worth it: yes, Everyone won't like it including my wife who said it tasted like the bacon her father liked. Real slab bacon. Received it yesterday. After tasting several fried pieces I chopped up 5 slices, fried (sauteed) them (it cooks quickly) drained bacon pieces into a strainer, then on a paper towel, placed the diced and cooked bacon bits into a sandwich bag and into the fridge for future use in beans, scrambled eggs and egg whites, salads, baked potatoes you name it. The video showed it is coated with salt during the curing process so it can be salty even though it is washed at the factory. But used as seasoning in other foods or eaten alone, I love it. I found out about this company through the netflix show Mind of a Chef. i decided to try it and hands down this is the best bacon you could have. the smokiness isn't overpowering but provides an amazing under tone for the flavor of the bacon to come through, and it isn't salty like most found in regular stores. save the fat and cook your eggs and potatoes in it! going to get more soon! I thought I'd give this a try since I'm tired of the low quality bacon available in the stores. I was even willing to try it with the very HIGH price ($50 for 4 lbs of bacon (includes shipping)). All I can say is that I'm VERY DISAPPOINTED. Two of the 4 packs were mostly fat instead of meat, even compared to the much cheaper stuff bough in a store. In fact, I threw one of them away because it was so bad. If I want bad bacon, I can find it in the stores for 1/4 of the price. The only thing this bacon has going for it is the very strong smoke flavor (if you like that kind of thing).